At my first clinical site, there was just one athletic trainer so it was easy to keep progress and rehab plans very routine and always consistent. 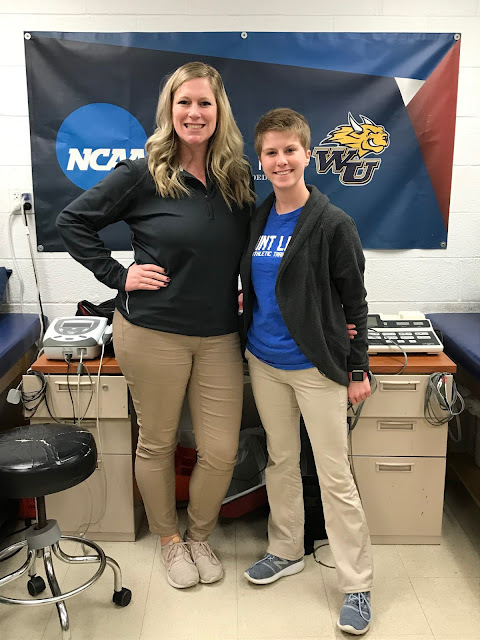 With two athletic trainers at Webster University, communication is super important. Communication is always key, but when only one of two ATs is there at a time, they have to document and communicate really well in order to not repeat or miss aspects of the injury and rehab process. Even though my preceptors, Martin Fields ATC and Jenni Popken ATC, have very different ways of doing things, they communicate with each other really well. They are always up-to-date with each other on athletes’ progression, as well as those with new injuries. Since they split the time pretty evenly and work with all the sports, most of the athletes know their different styles. This is helpful when they see Jenni in the morning for rehab, and Martin for treatment before practice, or vice versa. They know how well Martin and Jenni communicate, but they know they need to communicate with their ATs as well. Another aspect of this that is super important is monitoring the healthy athletes. There is a two-sport athlete who is coming off basketball season, immediately beginning baseball season. There was ever a little bit of overlap with basketball playoffs, so it was important to make sure he was taking care of himself. Since basketball is in the afternoon and baseball practices at night, we need to be sure he is getting enough sleep. Jenni and Martin do a really good job at making sure he is eating well and keeping up with his schoolwork. They both make sure they are checking in with him, which is really nice to see because they are a great example of how much athletic trainers care about their athletes as people, even outside the athletic training room.